August Mix it Up challenge! I spent some time yesterday organizing my craft space. My desk was over flowing that I kept loosing stuff and spent more time searching than crafting. So I clean my desk and rearranged a few things around to create more space. Also I bought IKEA’s Raskog cart recently. I organised stuff into the cart as well. With some awesome inspirations from dear craft friends from FB, I did organise the top and middle shelves of the cart. I now had an awesome clean desk and organized space. It made me craft and I made a card. 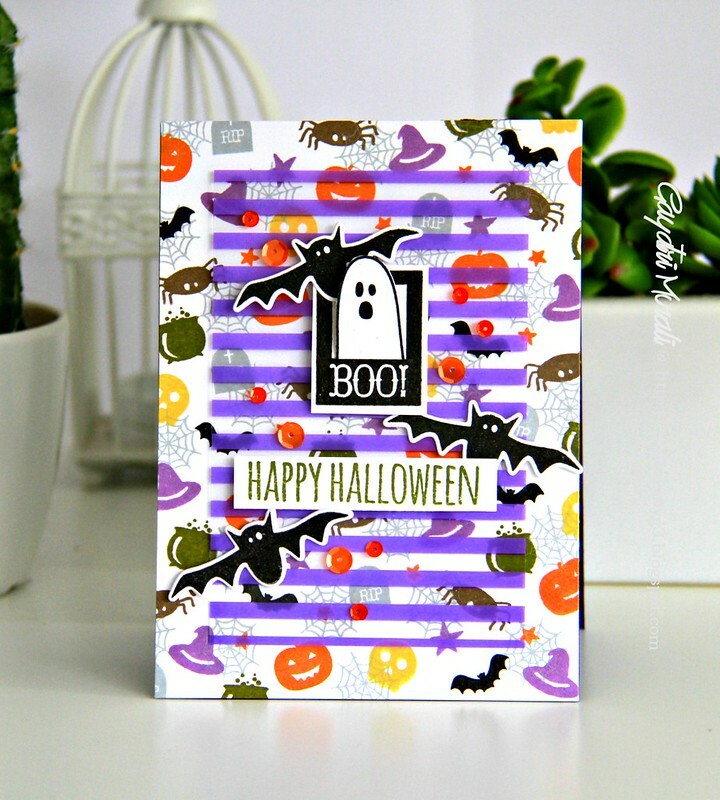 🙂 I made a Halloween card for August Mix It Up Challenge at Ellen Hutson blog. This month’s mix up is with Clearly Besotted. Here is my card for the challenge. 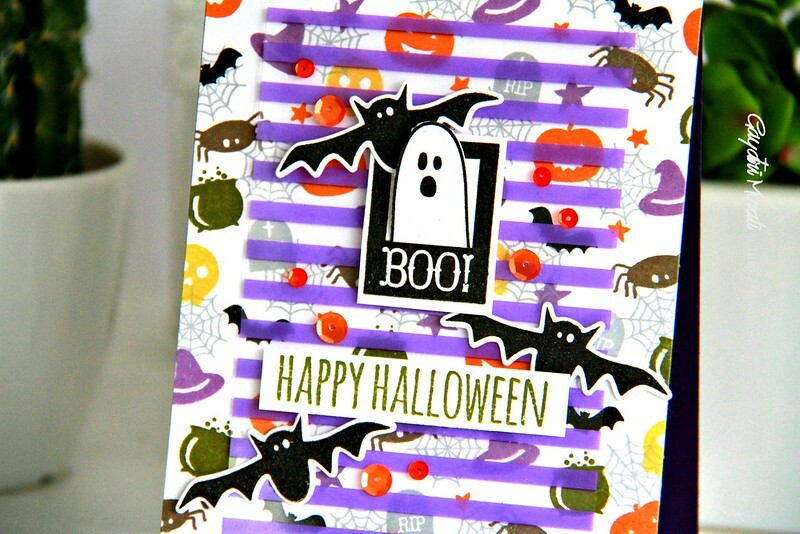 I used Halloween Spirit stamp set from Clearly Besotted along with Got Candy stamp set from Essentials By Ellen to stamp and make the background on my card. I used Halloween colours to stamp all the tiny images from both the sets. For the focal point, I stamped and cut the BOO! frame from Halloween Spirit stamp set and the ghost from Got Candy stamp set. I made a slit on the frame and slide the ghost image from the back to the front as though the ghost image is scaring somebody. Got it? I have a thought block on this. lol! I adhered this on a purple striped acetate sheet from We’re Memory Keepers. The sentiment is from Got Candy stamp set stamped on a strip of white cardstock and adhered using foam adhesive. I also stamped and die cut the bats from Got Candy stamp set and added to the panel. Finally embellished with Pretty Pink Posh’s Tangerine 6mm and Pumpkin 4mm sequins.